As many of you know I’ll be giving birth at St Michael’s Hospital in Bristol quite soon, but it’s not about me in this post. This post shall raise awareness for a great cause that I have become aware of when going for my regular scans, a cause that helps to support Special Care Babies at St Michael’s Hospital and a cause that I find more than worthy to be supported by everyone who has got some spare pennies: The Cots for Tots Appeal. The Cots for Tots Appeal is raising funds to support the expansion of the Neonatal Intensive Care Unit at St Michael’s Hospital by providing a Suite of four new intensive care cots and a Family Accommodation Unit so that parents can stay close to their baby on the Unit. The special thing about the Neonatal Intensive Care Unit at St Michael’s is that it’s the only one of its kind in the South West region able to provide surgery for the most serious and complex conditions in premature and critically-ill babies. As more and more babies are surviving and care for babies born as early as 23 weeks becomes possible, the Unit is experiencing unprecedented demand for the specialist cots and equipment needed for life-saving care. 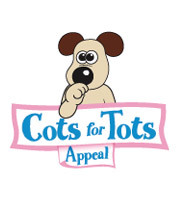 As The Cots for Tots Appeal receives no statutory funding and relies on the public for support it would be great if you could support the Appeal to help premature and critically-ill babies by donating whatever you can. Hold a tea or cake morning at work, dig out your old photos for a Guess The Baby Competition or fill a money box to the weight of a premature baby. There are endless ways of how you can help. So, please, do help if you can – you could safe a baby’s life. Click the logo to donate! Previous Post: « Birth Plan: To write or not to write? What a lovely idea! I'm hoping for a home birth but St Michael's Hospital is my backup. I may bring some sort of fundraising element into our baby shower.